I think the Economist should rename its Unit or put something like ‘Sub-‘ before the ‘Intelligence’. As regular readers of my blog will appreciate, in my 2015 book – Eurozone Dystopia: Groupthink and Denial on a Grand Scale (published May 2015) – I argued that the Eurozone political elites claim that there is no alternative (TINA) but to impose more austerity by cutting fiscal deficits and enforcing widespread cutbacks to social welfare systems. The major political parties in most nations – whether in government or opposition – have unquestionably accepted the dominance of neo-liberal ideology, which has not only homogenised the political debate but also obscured the only credible routes to recovery. A correct assessment of the current state indicates that fiscal deficits have to increase. Austerity is exactly the opposite policy response that is required. A sustained recovery in the Eurozone and elsewhere requires a categorical rejection of mainstream macroeconomic theory and practice and a reorganisation of the institutional structures to allow deficits to increase. The assessment is that this can only be done if the union is dismantled. The book explained that the neoliberal Groupthink that had captured the major political movements in Europe had erected a wall of denial and the European politicians successfully convinced people that by maintaining price discipline, economic growth would be maximised. The GFC exposed how ridiculous that mantra was. But those who dared question the Monetarist supremacy at the time, and instead, advocated Keynesian remedies to reduce the entrenched European unemployment, were met with derision from the bulk of the profession who had embraced the new economic theory and its policy implications. I was writing that in 2014 into 2015. Three years later nothing much has changed except the political manifestations are now more pronounced. While the neoliberal elites continue to talk endlessly about ‘reform’ and continue to hold talkfests and issue meaningless communiqués, like the latest Statement (June 28, 2018) from the Eurogroup after its summit in Brussels, the rise of radicalised political parties and the demise of the traditional parties (particularly the social democratic parties) in national elections is now unfolding. The recent election results in Italy are the latest demonstration of how the elites are losing ‘Europe’. As a strategic conjecture, I concluded that it would be ideal if the Eurozone nations agreed to an orderly dismantling of the common currency and a restoration of the individual currency sovereignty for each nation. But the Groupthink is too strong to allow that sort of sense to prevail. In lieu of such an unlikely turn of events, I argued that exit remains the superior option for an individual nation such as Greece or Italy, acting unilaterally. In fact, given the size of the Italian economy in relation to the overall Eurozone economy, Italy should demonstrate leadership by finalising a negotiated exit with Brussels that minimises the damage for all parties. This would provide the blueprint for other nations such as Greece, Spain, Portugal and others to follow should they wish. Four years later, that remains my view. 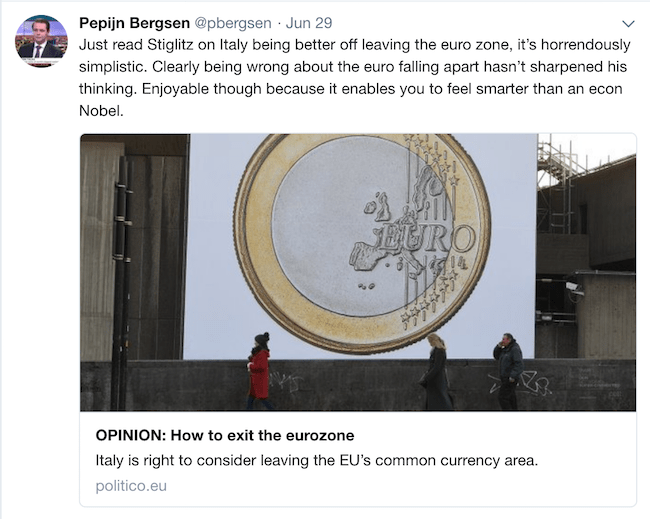 And so it was of interest to read Joseph Stiglitz’s latest Op Ed on Politico – How to exit the eurozone (June 29, 2018) – where he seems to be firming in his previously less firm position on the Eurozone and advocating positions that I outlined above. In his 2016 book – The Euro : How a Common Currency Threatens the Future of Europe – Joseph Stiglitz was somewhat ambivalent. In that book, he correctly concluded that the design of the EMU was flawed from the start and was certain to fail. His assessment that a fundamental shortcoming was the lack of ‘federal’ institutions capable of dealing with asymmetric and negative economic shocks to Member States in addition to the persistent trade surpluses run by Germany at the expense of its EMU partners was sound reasoning. I disagreed with his assessment as to why these fatal design flaws emerged. … was created with the best of intentions by visionary leaders whose visions were clouded by an imperfect understanding of what a monetary union entailed. I don’t think that assessment is correct. As I argued in the 2015 book (cited above), Jacques Delors knew exactly what he was doing when he set up his committee to produce the 1989 Delors Report. For a start he deliberately excluded the Economics and Finance ministers from his Committee preferring to stack it with central bankers and neoliberal economists because he knew that the Monetarist ethos would be jointly held by the group and that it would allow him to propose a structure that was acceptable to Germany, especially in relation to the lack of fiscal capacity and the independence of the central bank. He also deliberately ignored previous studies into the possibility of European integration (Werner Report, 1970; MacDougall Report, 1977) which had indicated that a federal fiscal capacity firmly aligned with the democratically-elected ‘federal’ parliament and integrated with the central bank was required for the common currency to be effective and successful. Further, in 1993, the European Commission’s own in-house economics journal, European Economy, published a “Report of an independent group of economists” on “Stable money – stable finances”. The so-called ‘independent group of economists’ was comprised of academics who eschewed federalism and espoused rather extreme ‘free market’ ideologies. The Australian economist that was consulted by the Commission for that exercise was a well-known advocate of the alleged benefits of dismantling regulation and generating government surpluses. I think Joseph Stiglitz is in error if he attributes good intentions to those driving the process to Maastricht and beyond. The key players had become infested with Monetarist and neoliberal ‘free market’ ideologies and wanted to further entrench those ideas into the political economic architecture of Europe. I also think he was in error in that book by arguing that the the euro is worth saving. He advocated a “flexible-euro” system, with perhaps a “strong Northern euro and a softer southern euro”. He also wanted a more “social Europe” where the ECB targets “employment, growth and stability, not just inflation”. The chances of that happening in the near future are … zilch. And that has always been the problem. What Germany requires to be part of the deal does not suit the vast majority of the other Member States. However, it is not just the cultural proclivities of Germans that is the problem. As I argued in my 2015 book, to some extent Germany were dragged into the common currency by France, which thought it was a way that they could establish their pre-eminence in the European context. The old French ambitions for its own grandeur! The other reason that the Eurozone remains a total disaster and resistent to essential (root-and-branch) reform is that the political forces that have historically brought evolutionary change – the social democrats – have become infested by neoliberalism. That is the thesis that Thomas Fazi and I explore and explain in out latest book – Reclaiming the State: A Progressive Vision of Sovereignty for a Post-Neoliberal World (Pluto Books, September 2017). And it is a theme that we will extend in our next book, which we are working on at present and hope to have published next year. It is the Left that has allowed the Eurozone to morph into a corporatist, anti-democratic, neoliberal morasme. And there are no signs that fundamental shifts in Left-thinking in the European context is changing. As an example, on September 22, 2016, the Green European Journal published an article – Why Joseph Stiglitz is Wrong – which was a review of Joseph Stiglitz’ book release (The Euro : How a Common Currency Threatens the Future of Europe) written by a so-called progressive Tunisian journalist Guillaume Duval. Duval is an editor for the French monthly magazine – Alternatives économiques – that began life to counter Margaret Thatcher’s TINA mantra. Its Wiki page says that its writers reflect a Post Keynesian slant and are critical of neoliberalism and “Le journal revendique explicitement une ligne éditoriale « de gauche »” That is, it reflects a ‘Leftist’ editorial line. It also publishes material that is popular with the “membres du mouvement altermondialiste” (anti-globalisation movement). So you might be surprised to read that Guillaume Duval thinks the euro was a vehicle to rescue Europe from neoliberalism. What is irritating in this context, coming from a progressive economist like Joseph Stiglitz – and he is far from alone – is Stiglitz’s apparent misunderstanding of the political stakes of the matter: the euro is first and foremost a way to break with the neoliberal approach to the Europe market. Duval’s argument is that the introduction of the euro transferred “a key element of sovereignty to the Union, allowing finally for common policies, monetary and exchange policies – not merely the sacrosanct policy of competition”. And, while ‘Alternatives Economiques’ regularly published articles that were critical of Brussels, it also believed that the EMU needed time to bed down. Duval claimed that Americans shouldn’t criticise the ‘work in progress’ that is the EMU because “it took 137 years after winning independence (and then a bloody civil war) for the Americans to create a central bank”. And that along the way there have been important “changes that have already been made to the architecture of the eurozone following the 2010 crisis”, which critics like Stiglitz underestimate. He claimed the “banking union has already been put in place”, despite lacking a “common deposit insurance”. He also claimed that the “‘Six Pack’ of 2011” introduced new “rules to limit trade surpluses”, which will allow German excesses to be curbed. And he extolled the virtues of the European Stability Mechanism as being almost a mutualisation of debts. Finally, he concluded that “regardless of what Joseph Stiglitz is saying, the euro has attained its objectives” and points out that the “ECB is engaged today in an extremely expansive monetary policy, and its balance sheet now exceeds that of the U.S. Federal Reserve”. All of which is quite astounding. And you get an idea that Duval struggles to understand macroeconomics when you read his discussion of what would happen to a nation that dared to exit the dysfunctional EMU. Despite claiming to represent anti-neoliberal thinking, Duval’s arguments are core neoliberal scaremongering. 1. “That state would immediately see the interest rate at which it borrows leap upwards sharply”. As a newly restored currency-issuer, the Italian government could just stop issuing debt if it desired. 2. “right away there arises the sticky question of the debts that have accumulated vis-à-vis the rest of the world”. Apparently, given that the new currency would depreciate then the debt burden will rise. But why would any of that happen? It is not clear that the Italian currency would depreciate significantly, but if it did that carries no implications for debt that it chooses, under the principle of Lex Monetae to redenominate in terms of the new currency. Then the risk is shifted to the debt-holders. Duval claims Greece new that would be the case and that is why it stayed in the EMU. But this is clearly delusional. As the currency-issuer, the Italian government could use its fiscal capacity to stimulate domestic demand. No austerity would be required and given the state of the labour market desirable. Duval claims that an exiting nation would have to “regain their ‘competitiveness’ vis-à-vis their neighbours. That is, to steal a march on them by grabbing their neighbours’ share of the export market and encouraging their neighbours’ businesses to cross over their border”. This would undermine European solidarity. Seems like that is exactly what Germany has been doing since day 1 of the Eurozone. 5. Finally, and we leave the best (worst) for last, Duval claims that “an exit that will plunge the continent back into the horrors of its past”. There is really no argument against that nonsense. Duval’s original article was published in French in Alternatives économiques, which I remind you began life and took on its title, as a response to Margaret Thatcher’s TINA suppression strategy. And so you would be interested in learning that Duval claims that “Europe has no alternative” but to stay with the euro. A sort of Animal Farm transition, n’est-ce pas! This is the way Groupthink becomes entrenched. And this was all written by a so-called progressive commentator. Which tells you how large a challenge it is to escape the neoliberal web that Europe has evolved into. I remember I was a speaker at a European Commission event in Florence in 1996. At that event, I was one of a few economists who were highly critical of the Maastricht Treaty and the potential of the EMU. The hostility at the meeting towards my views, though suppressed by the sort of artificial politeness that is common at these sorts of events, was profound. I was told that I was not European and so couldn’t understand the imperative of establishing a common currency and the liberative elements that the euro would bring. A repeating theme. Shut the f**k up because you are not European. As if research and observation have no place. Groupthink. This is the problem of the Left in Europe. These views on what the euro represents and what would happen if a nation exited are so misguided and embedded with neoliberal myths that it is almost impossible to have a reasoned argument. Here we have a group that proposes its initial existence as a bulwark against TINA morphing into a bulwark for TINA. At least there has been some shift in Joseph Stiglitz’s position on the Eurozon. His latest article in Politico (cited above) indicates that he has moved more into the breakup camp as the folly of the European elites continues. What’s the best way to leave the euro? That is progress in my estimation. The euro has been flawed since its conception. For countries like Italy, it took away two key adjustment mechanisms: control over interest rates and exchange rates. And instead of putting anything in their place, it introduced tight strictures on debts and deficits — further impediments to economic recovery. And the conclusion that the “euro was supposed to usher greater prosperity” but “has done just the opposite” is undeniable in my view. How the Europhiles can claim it has been a success is beyond me. Yes, I can understand those who have a visceral attachment to the idea of European integration – a sort of ‘wouldn’t it be nice if we were all one in harmony’ type of vision. And some have the sense to admit the current experiment has been a disaster but hold out hope that long-term reforms will put it all right. I think they are misguided and fail to understand the roadblocks that are in place that will prevent any reasonable reform happening within any reasonable time frame. Waiting 10, 20 or whatever years to ‘get it right’ is not acceptable in my view. Each generation of citizens that enter adult life with the horrific youth unemployment rates is one generation too many that is being wasted by these ridiculous austerity policies. But I cannot understand anyone who claims the euro has been a success and is on the right track. Joseph Stiglitz correctly identifies that in terms of reforms, the “problem is Germany’s reluctance to do it”. That has always been the problem. The other nations should never have tried to coax Germany into a common currency. It was bad enough when the post-Bretton Woods attempts at currency stability just morphed quickly into becoming a Mark-zone, given the lack of cooperation that the other central banks received from the inflation-obsessed Bundesbank. The following graph shows movements in monthly exchange rates (available at the Norges Bank) from January 1960 to February 2002 (when the Member State currencies ceased and the euro became the only currency in circulation). The rates are expressed as indexes (January 1960 = 100) and as parities against the US dollar. So a rising trend indicates that the specific currency is losing value against the US dollar and vice versa. The graph allows us to understand very clearly why the EMU should never have been created in its current form. After Bretton Woods collapsed in August 1971 and the US dollar floated, the attempts at maintaining stability among the European currencies proved difficult. I documented the history of the currency arrangements post-Bretton Woods in my 2015 book – Eurozone Dystopia: Groupthink and Denial on a Grand Scale (published May 2015). The conclusion was that these economies were so disparate that trying to bind them together with fixed exchange rates or, indeed, the next step, a common currency would not deliver satisfactory outcomes. And Germany’s behaviour post-February 2002, where they engineered a massive internal devaluation (Hartz) and aggressively pursued ever increasing current account surpluses, has only served to exacerbate these disparities. That is why Italy is now on the brink and economists such as Joseph Stiglitz are now in the exit camp. 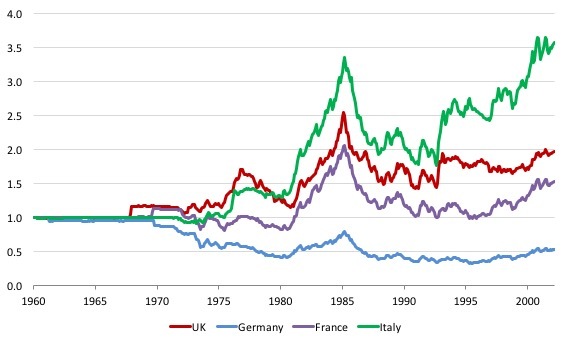 The following graph shows the REER movements from January 1994 (first available BIS data) to February 2002 for France, Germany, Italy and the UK. We saw in the previous graph that the nominal exchange parities diverged for Italy and Germany. This helps us understand the movements in the REERs. 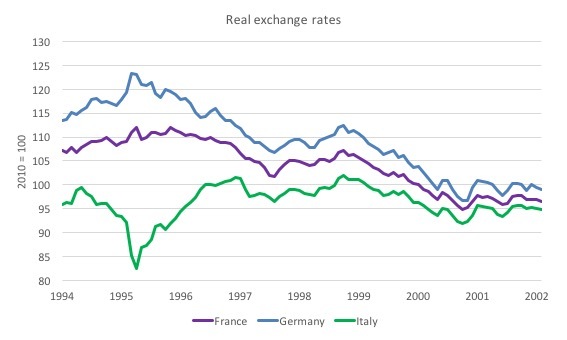 Italy was able to maintain international competitive vis-a-vis Germany and France over the latter half of the 1990s and into the euro period because its nominal exchange rate was able to move even though there were currency arrangements in place (the EMS) to manage the amplitude of those movements relative to the other participating European currencies. Italy has the opportunity to make a different choice. In the absence of meaningful reforms, the benefits for Italy of leaving the euro are clear, straightforward and considerable. There is no doubt about that and the continued denial by Europhile commentators is testament to their insecurity. They know that if a nation was to exit and restore domestic demand and enjoy a boost in their international competitiveness (or maintain it without the destructive internal devaluation) then the blueprint is set – for the rest to follow. Then the game would be up. They wheel out productivity graphs like the following one (using OECD data) with the indexes of GDP per hour worked set at 100 in 1990. 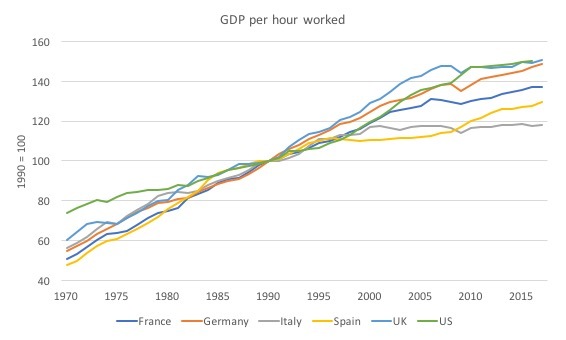 Irrespective of the base year chosen, the data shows that hourly productivity in Italy slowed in the 1990s, well before the euro was introduced. Therefore, these geniuses conclude, Italy’s problems are not related to the euro. What they don’t tell you is that the almost all nations have experienced a slowdown in productivity since the GFC. 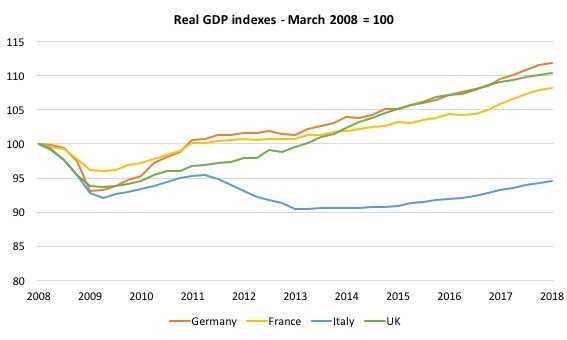 So Italy has not underperformed in that regard. And the slowdown that Italy experienced in the 1990s was in no small part driven by explicit government choices. If one digs further into the data it becomes evident that Italian manufacturing continued to demonstrate on-going productivity growth through the 1990s and beyond, albeit slightly below the rates experienced by France and Germany. But productivity in the construction sector, and more clearly, in the services sector drove the overall fall in productivity post 1990s. Why might that have occurred? The Italian government introduced two waves of significant labour market changes in 1997 (the Treu Package) and in 2003 (the Biagi Law), which were aimed at stimulating employment growth for low-paid workers. in Italy: A Review (December 2017)). The share of temporary employment in the total number of employees increased from less than 8% in 1998 to nearly 15% in 2015Q3. These are exactly the sort of so-called ‘reforms’ that the organisations such as the IMF promote. What these changes achieved was strong employment growth at the expense of increased duality in the labour market, which anyone with a brain predicted when we became aware that the Government was introducing them. Yes, they reduced unemployment and provided employment opportunities for the least-skilled workers. While temporary contracts have a role to play in the economy, excessive labour market segmentation is found to be associated with low access to training and weak career progression, with negative implications for productivity and labour market volatility. That is the Italian story. Why don’t the Europhiles elaborate on that history when they take cheap shots with their productivity graphs? It was the wrong way to stimulate employment growth. It would have been better to maintain employment standards and introduce a Job Guarantee to absorb low-paid workers that were struggling to find work elsewhere. What the data tells us is that Italy is trapped in a mire of stagnation, which is placing its Society in peril. The following graphs show real GDP growth performance and unemployment rates. The Italian economy is around 6 per cent smaller than it was in the March-quarter 2008. It cannot get out of that mire with the current policies that the European Commission wants it to follow. It has to stimulate domestic demand and that will require higher fiscal deficits for a prolonged period. The bond markets will not allow that and the ECB will only keep spreads stable (and facilitate ongoing funding of the Italian government), if Italy bears down further on its current austerity bias. That is the way the Eurozone works – via the currency issuer breaking the Treaty (with its QE program) and then blackmailing Member State governments with threats of sending them broke if they do not toe the ideological line. That alone is why Italy should exit. 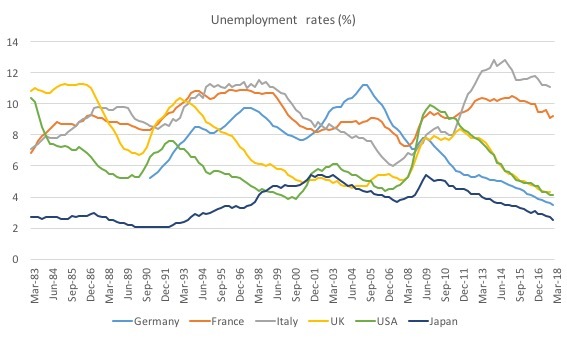 Italy also has elevated unemployment rates and a young generation in danger of missing out on the usual pathways to adulthood as a result of its appalling growth performance and the fiscal policy settings that have caused it. The cost of persistent unemployment, especially among its youth, is enormous. Young people in their 20s and early 30s should be honing their skills in on-the-job training. Instead, they are sitting home idle, many of them developing a resentment toward the elites and the institutions they blame for their predicament. The resulting lack of formation of human capital will also dampen productivity for years to come. I remain of the view that Italy has to exit the currency madness. It is big enough to absorb the political shocks that would follow. But while Joseph Stiglitz is correct in saying that the Eurozone disaster is now undermining the entire European Project and introducing new problems that will escalate out of control. The problem for Italy is that these social instabilities are already advanced. Exit must become the priority for its Government. A big part of the problem that MMTers and other heterodox economists have is that they are all still trying to change the minds of those who have an egocentric reason not to see the efficacy of reform…let alone paradigm change. Somewhere along the line they must have forgotten their marketing studies. Great analysis. Only thought i don’t agree with is “Italy should demonstrate leadership by finalizing a negotiated exit with Brussels that minimizes the damage for all parties.” – Anytime somebody wanted to challenge EU (on core fiscal/economic rules) they made sure that deals were really bad, even if that hurt them also, as a reminder to all “how we are going to treat you if you rebel”. So i think that as for Uk and Italy, or anybody else for that matter, you should be prepared to do no deals, no negotiation, no communication (except minimum and maybe informal)-unfortunately. And, my apologies for taking your space, i just wanted to add – there was a video of Thomas Fazi with hungarian economist Péter Róna and he said – you make an detailed euro exit plan (not public of course), you come to Eurogroup or whatever core “commission” and you say – “here is what we want you to sign, you have to agree on all core requests if you want us to stay in euro. We will now go to ourhotel and come back in 3 hours. Taking Duval’s (outrageously xenophobic) point at face value – that a non-European can have no real understanding of European economics (!) and, by implication has no right to be taken seriously and can be safely ignored, then, as a Tunisian, Duval has no business writing about Europe either. TINA revisiting aside, could he not spot the irony in that ridiculous assertion? As well as their Upton Sinclair and their Max Planck! “[N]eoliberal Groupthink that had captured the major political movements in Europe” can be extended. It seems as if virtually the elites of the entire world have taken the blue pill and are dismayed that those who have not taken the blue pill, or taken the red pill instead, are displeased with elite thought and action. How myopic of them if not masochistic to fail to notice the pushback. What is surprising is the disorganization of the resistance. Mr Shigemitsu, I don’t think Bill can be fairly accused of forgetting his Planck, even though he does not employ this phraseology, paraphrasing, that science advances one funeral at a time. Steven Hummel, Bill has often said that marketing is not his metier and has to leave that to others. He is not unmindful of it. However, the field is so reactionary that even adept marketers may find their job of altering the given narrative rather difficult and filled with pitfalls. Having said that, Stephanie is not bad at this though she is an academic. Academics are notoriously bad at marketing; it is a rather specialized skill. Then again, maybe marketers have largely swallowed the blue pill and are thereby unable to return to their original choice point. Yes, I belatedly realised that my post may have appeared to give comfort to critics of MMT, which was far from my intention. There does appear now to be an understanding, however, that there’s no point arguing with those adversaries who are dead set against MMT, because the more it’s pointed out to them how wrong they are, the more entrenched they become – hence my references. Instead it seems that the best promotional strategy is to appeal to undecided and open minds, and Prof Mitchell, amongst others, does a fine job in this regard. Upton is closer to truth. When the truth runs against the interests of the wealthy and the powerful the wealthy and the powerful step on the truth. Neoliberalism is the concretization, the physical expression of the psychological structures of private wealth and power. For decades they’v been culling, gleaning, discrediting. They’v restored an economic thought that flatters and serves them. People are rewarded here congruent with the extent they promote and serve the interests of the wealthy and the powerful. They provide the reward – success. Mystro Ignominious knew it. The more effectively you serve – the greater your reward. That’s how the top economists in the country miss the greatest financial, economic event in 79 years. Gradually, over time, you lose the power of critical thinking. It a liability, not an asset. You might let something slip. You might get afraid of where you’r actually going. You don’t look for the truth. You look for how to advance. There’s only one group that hands out the rewards. You can’t allow certain questions, facts, circumstances to initiate a line of thinking that through logic leads to the inevitable conclusion that TRUTH speaks against the inequality that you enjoy and hold so dear. For the marketing of the Politics of Care and #MMT, look no further than the MMT Manifesto for the 21st century: Reclaiming the State: A Progressive Vision of Sovereignty for a Post-Neoliberal World. Thanks very much. I appreciate the scrutiny. Might it be possible for Italy or Greece or any other country to establish a second, parallel currency that the govt could use to create the necessary demand within its borders? I am thinking of a crypto currency, for example. What if the policies one was marketing could be shown to be temporally in the abundant interests of BOTH the individual AND commercial enterprise? And also ended the dominating and monopolistic monetary and economic paradigm of private finance?